CATHERINE DENEUVE, Antonio Banderas, Sean Penn, Brad Pitt, and Audrey Tautou are among the big name stars who will appear on screen during the Galway Film Society’s autumn/winter season. This season of Irish, French, Iranian, Turkish, Canadian, Danish, American, and Spanish films runs at the Town Hall Theatre from September 23 to December 4. The opening film, the Irish film Living Colour, will be screened on Friday September 23 at 9.30pm and will form part of Galway’s Culture Night events. Living Colour is an observational documentary film exploring a Kilkenny artists’ collective which focuses on the artists’ abilities instead of their special needs. It also throws up questions about the human need to make art. Admission is free but tickets must be booked through the Town Hall. Two giants of French cinema - Catherine Deneuve and Gerard Depardieu takes centre stage in French film Potiche (2010 ) on September 25. Set in 1977, it follows the life of where Suzanne Pujol (Deneuve ) lives the life of a traditional housewife, doting on her grumpy husband who is driving her family’s umbrella business into the ground. When the workers go on strike all hell breaks loose and Suzanne is left to run the company with the help of her former beau, the town mayor. Iranian film A Separation (2010 ) is up next on October 2. Simin wants to leave Iran with her husband Nader to find a better future for her daughter Termeh. Nader though is worried about leaving behind his sick father and calls off the trip igniting a legal battle between husband and wife. The film won the Golden Bear award at this year’s Berlin Film Festival. Turkish film Honey (2010 ) was also a Golden Bear winner at the 2010 Berlin Film Festival. Six-year-old Yusuf enjoys accompanying his beekeeper father Yakup into the woods and watching him tend to the beehives. However following a strange dream, Yusuf finds he can no longer speak and the bees have disappeared. What happens to Yusuf and his family? Find out on October 9. In Canadian film Incendies (2010 ) a Montreal attorney meets two adult twins, Jeanne and Simon, to read them their mother’s will. He startles them by presenting two letters - one to a father they thought was dead and another to a brother they never knew existed - that their mother would like them to deliver. They travel to Lebanon to locate their father and brother. As their adventure unfolds and the pieces are joined together, the twins discover the secrets their mother kept from her children during her lifetime. See what they discover on October 16. In The Big Picture (France, 2010 ), Paul has a great job, a glamorous wife, and two wonderful sons, but his life unravels when he discovers his wife has been having an affair with photojournalist Gregoire. This leads Paul to reinvent himself and assume a new identity that will enable him to live life fully. Find out what happens to him on October 23. Sean Penn and Brad Pitt star in The Tree Of Life (USA, 2010 ) which will be screened on October 30. Penn plays Jack, a corporate executive who enjoys reminiscing about his boyhood in smalltown America in the 1950s. The Guardian called it a “mad and magnificent...meditation on memory, and a gasp of horror and awe at the mysterious inevitability of loving, and losing those we love.” The film also won the Palme D’or at the 2011 Cannes Film Festival. See it on October 30. The Oscar winning Danish film In A Better World (2010 ) will be shown on November 13. Anton and his wife Marianne are teetering on divorce and their eldest son Elias is being bullied at school. Meanwhile Claus is coming to terms with his wife’s death and struggling to comfort his son Christian. The two families become connected when Christian defends Elias from the bullies at school and the boys become friends. Starring Antonio Banderas and directed by Pedro Almodovar, The Skin I Live In will be among the ‘must sees’ of this seasons films. Banderas plays a Madrid plastic surgeon who advocates transgenic treatments from animals to toughen the skin. At home in his private operating theatre he carries out experimental work on Vera, whom he keeps prisoner, and whose skin has an unnaturally smooth, flawless look. See it on November 20. 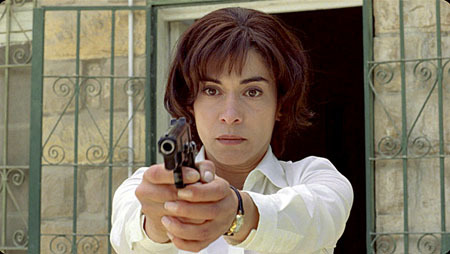 Audrey Tautou stars in Beautiful Lies (France, 2010 ), a fresh and funny romantic comedy about a chatty hairdresser who concocts a plan to cheer up her mother who is devastated after having been left by her husband. See it on December 4. There will be a ‘surprise French film screening’, in association with IFI French Film Festival and Access Cinema on November 27. Details will be announced nearer the time. The Christmas film will be Frank Capra’s Pocketful Of Miracles (1961 ), starring Bette Davis and Glenn Ford, on December 4 at 3pm. It features an apple seller who is helped by a gangster and his small-time hoodlums to pose as a high society lady when her long lost daughter returns from abroad. Expect carol singing, spot prizes, and light refreshments ahead of the screening.